For the Arts and Crafts enthusiast, we offer a set of fireplace accessories especially designed to enhance this type of decor. 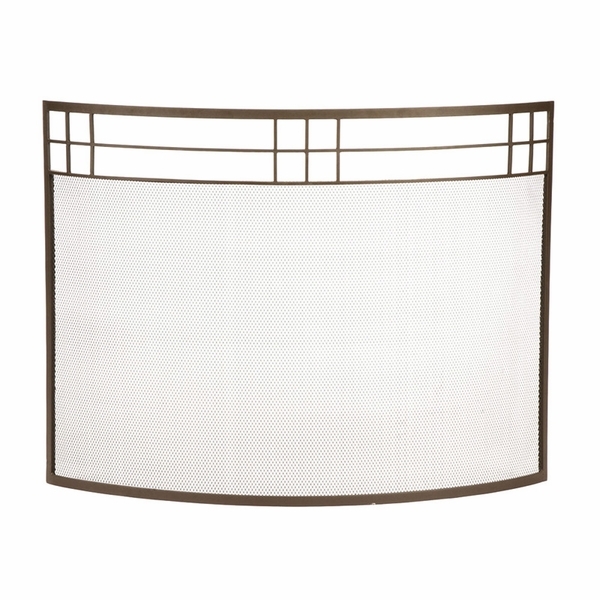 Set includes a self-supporting, curved fireplace screen in Roman Bronze finish, a matching oblong stand with four tools, and matching log holder. Ergonomically designed tongs have three prongs with a "T" handle to assist in lifting and repositioning logs and kindling. A separate suede carrier is available to fit the log holder for ease in transporting and storing logs and kindling. These hearth accessories are crafted in high quality wrought iron and can also be used for any outdoor fireplace. I was mostly satisfied with this Arts & Crafts fireplace screen. My only constructive comment is that the color tone of the item was not accurately displayed. It is a little darker than expected and not as radiant as I thought it would be. The screen is very nice and set up without any assembly needed. The design fits well with the arts and crafts decor look. Not long ago we installed an electric fireplace during an intense remodel project. We really liked the way the fire looked, but thought it would look even more impressive and "real" if we put one of these screens in front. It looks wonderful and adds to the charm of the room. We are very happy with our purchase. This fireplace screen is the perfect size for my fireplace. The actual product is a bit darker than the picture appeared, but it still looks nice in the room. Our new Arts and Crafts Curved Screen arrived safe and sound. We weresomewhat anxious at first glance as the cardboard packaging looked pretty sad and worn. But the item inside was in perfect shape, and it is obvious thata lot of care went into the packaging of the screen. We misunderstood and thought a few accessories were to come with the screen, but that was our mistake. You will receive just the screen, of which the quality is very sturdyand solidly built. We are very happy with our latest purchase, and the darker color looks wonderful with our brick fireplace.